Moving Haze: Taking Care Of Myself. 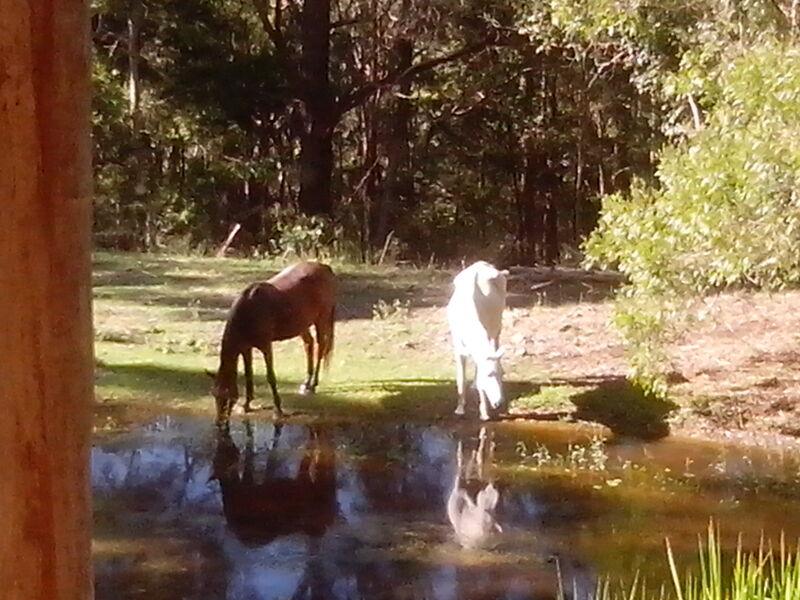 This is going to be a very short post, I’ve just spent two days moving out of our bush paradise back into town and I’ve hardly stopped all day and now it’s time to take care of myself. I don’t want to re-blog something without some kind of good reason so I decided to just be totally honest with you and make this really brief and to the point. 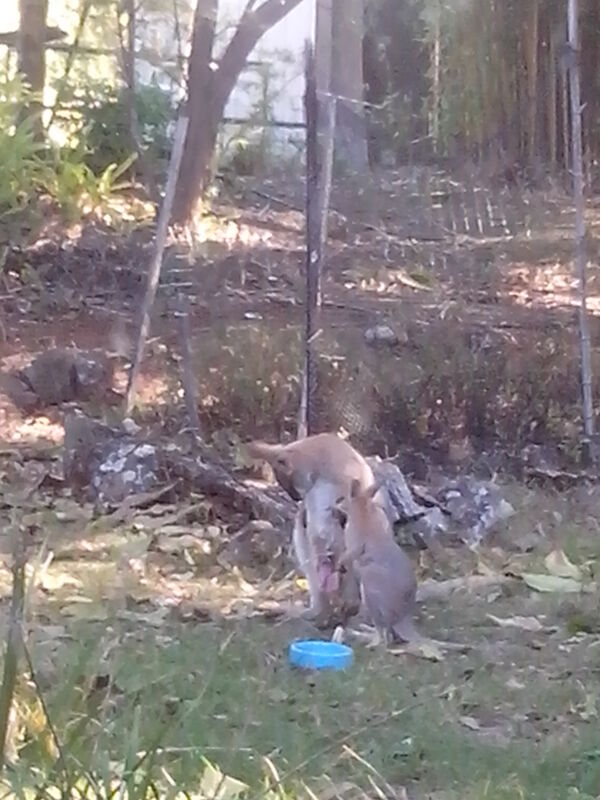 The Single Mother’s Club, both of these wallabies have joeys. 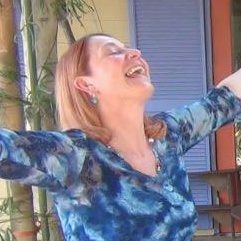 There are times when you have to let go of things you would like to achieve in order to take care of yourself, on the physical, mental, emotional and spiritual, whatever you may need. Yes I could have had a post prepared early but it didn’t happen, if you stick with me and read future blogs they will come from someone whose brain is actually functioning. I promise you it will be fun, informative and sometimes even a bit profound. But for now farewell and goodnight, sweet dreams to you all, or sweet sunshine depending on your time zone! 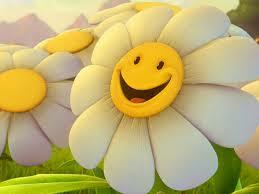 Until further notice celebrate everything! ( St Germain through Azena Ramanda). 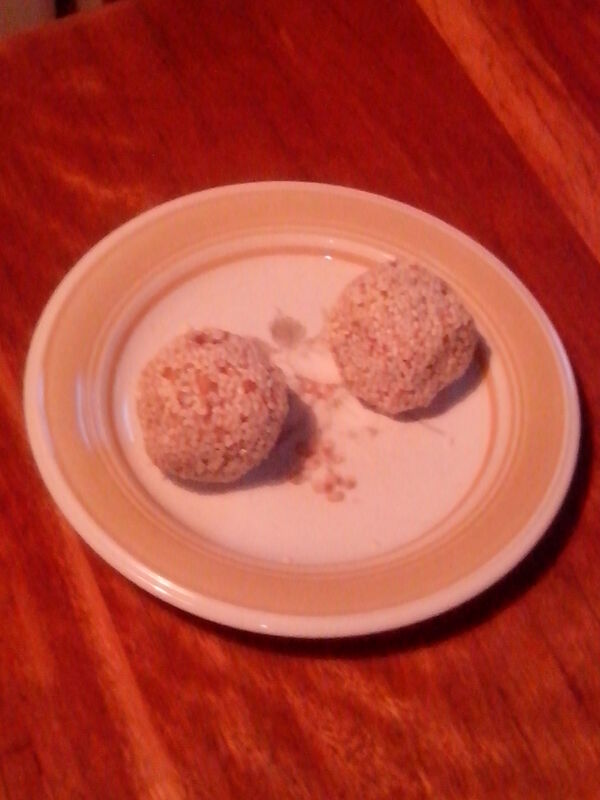 My very first Bliss Balls! For anyone who actually noticed, big apologies for not offering my usual Wednesday post. I got up in the afternoon having done an overnight shift and I spent the day with my Beloved having cups of tea and making bliss balls and omelette stuffed with garlic and onion and turmeric. To say nothing of the pot of fresh lemon and ginger tea, I was very conscious of having food that suits the season. For us here in the southern hemisphere its full Winter and the fruit trees are groaning under the weight of lemons and oranges and mandarins, a good example of nature providing lots of support to the immune system at a time when people often get colds and flu. 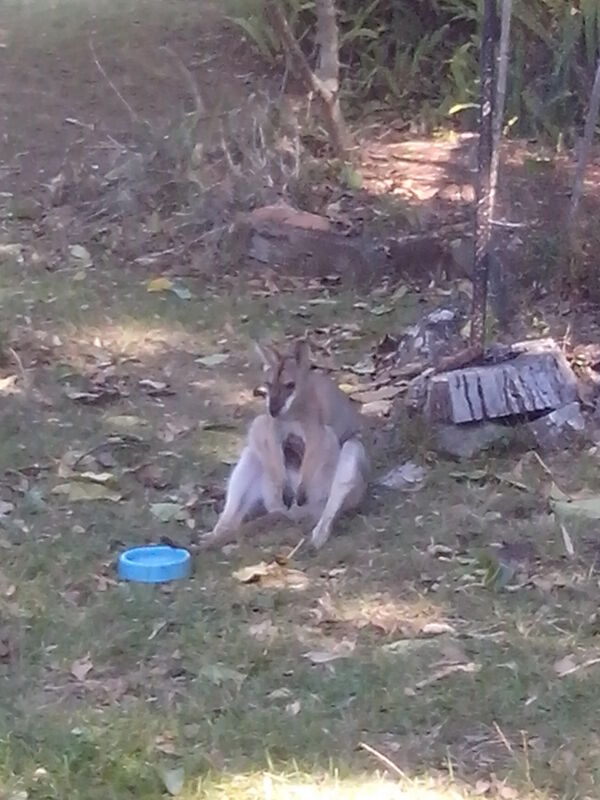 Mama with joey in pouch having a well deserved rest. 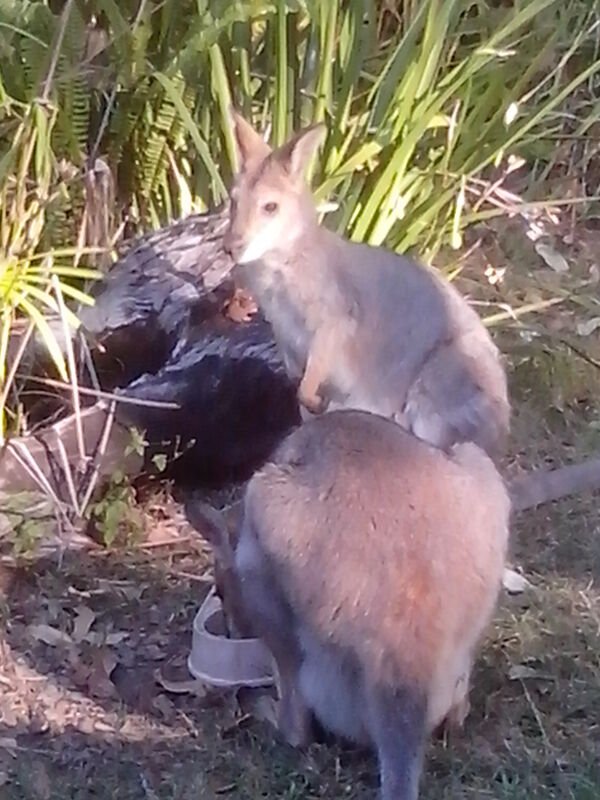 Mama with joey out of pouch, if you can’t see the little one click on the image to make it bigger. We also had some particularly good entertainment from the wallabies, there is a mother we have been watching for the last three months as the joey in her pouch has grown bigger and bigger. He didn’t have any fur at all when we first used to see him, just very pink and tiny. 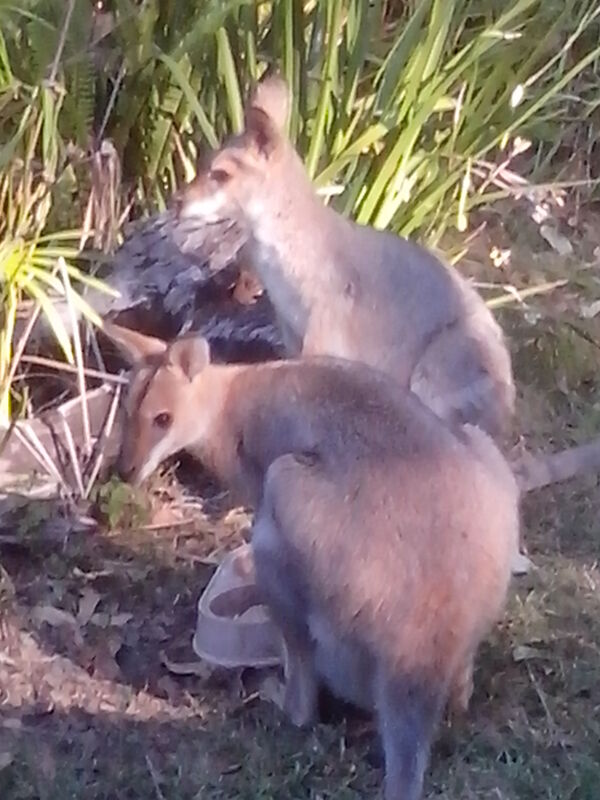 They decided to hang out in the garden yesterday and the little one is not so little anymore, he was out of the pouch and even grooming his mother at one point! 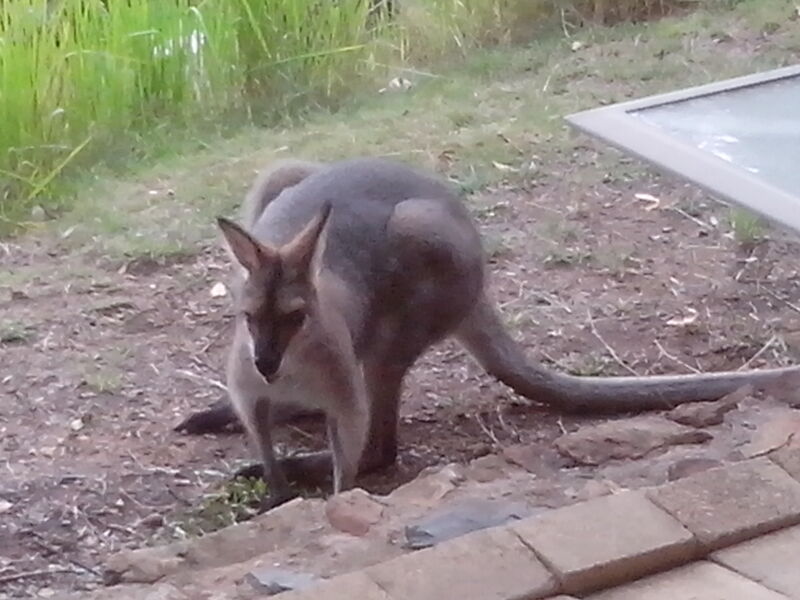 It was wonderful to watch and my Beloved decided to say thank you by giving her some of the macropod pellets we give them every morning. We ended up with three mums turning up with babies in pouch and I decided that it must be a single mother’s support group. It’s so special to see the wallabies lounging around the garden as they often do here, apparently they are nocturnal and spend a lot of the daylight hours resting. There is nothing quite as chilled as a wallaby stretched out on the grass, and lovely to receive their trust as they make themselves so vulnerable to we dangerous humans. The most dangerous animal on the planet without a doubt, the animal known as man, but methinks we are learning to be softer and more pliable, prepared to be a part of our environment rather than lording it over everything. Hope you enjoy the pictures, I don’t often wish for a good camera but if I had one then I could easily have enough great pics to start a career as a wildlife photographer! Here are a couple more for you to have a look at. The Earth, A Sanctuary For Us All! We need to clean up our act on so many fronts as a race of beings, not only do we treat each other abominably, we also behave shamefully with the creatures we share this planet with. 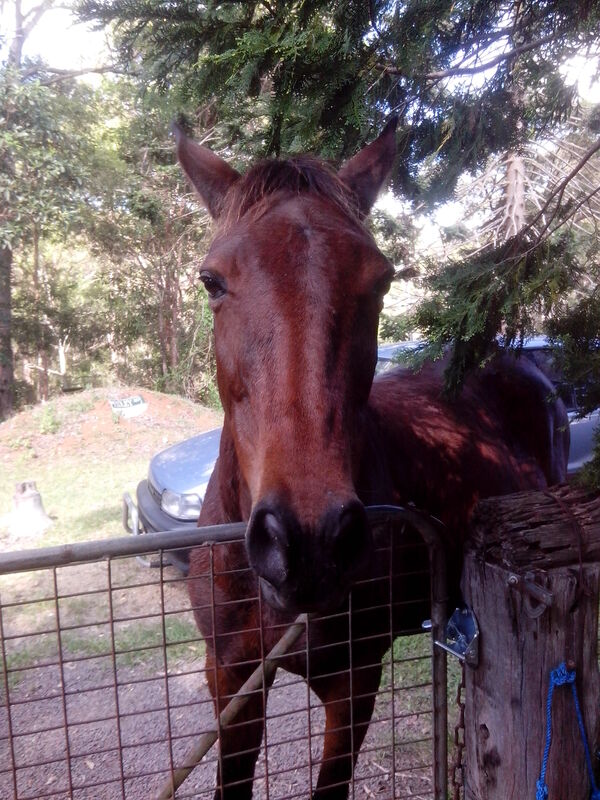 I am thinking very much about animals at the moment while I am living in a bush sanctuary, the rescue animals are not here but I feed wallabies and birds every morning before feeding the horses. To see wild animals so relaxed and at ease right next to human habitation is heart warming, there is nothing quite so chilled as a wallaby lying down! Quite apart from inhumane treatment our industrial culture is destroying habitat at a rate of knots, I am still actively appalled at an Australian Government that is allowing mining companies to dredge the Great Barrier Reef! If you are not from this country and not familiar with the reef I suggest you look it up, it is one of the natural wonders of the world, at least what’s left of it is. Not only is it being destroyed for our children, animals and all kinds of amazing plant life depend upon this jewel in the tourist crown of Oz. What right do we have to condemn whole species to death for our own short-term gain? Look at this beauty below, surely it needs to be preserved and honoured.